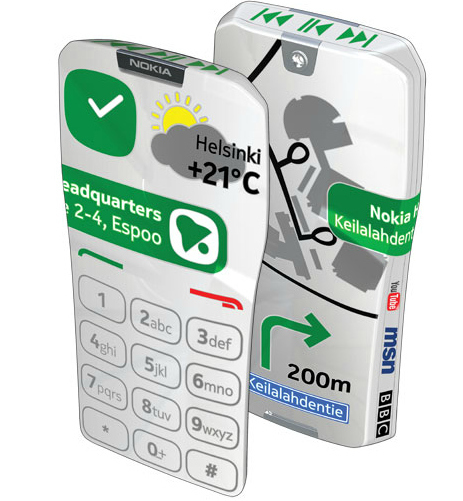 To celebrate the 25th anniversary of the Nokia Research Center, the Finland-based mobile phone maker has unveiled a new concept phone, the Nokia Gem. The unique thing about the Gem is that the entire surface of the handset is a touchscreen that changes its appearance depending upon on the function chosen by the user. Choose the map function, for example, and the whole of one side of the device (the virtual keypad will disappear) will show a detailed, close-up map of your location while the other side will show a broader view. And as you can see from the images, no space is left unused – even the sides of the device are covered in virtual buttons. It’s even suggested that advertising messages could be displayed on the back of the phone, enabling its user to receive a discount on bills. When you consider all the dead space on the surface of a mobile phone, it makes perfect sense to somehow utilize it. However, with the whole device transformed into a touchscreen, it’s not entirely clear how you’d avoid accidentally activating functions you don’t want to activate. But overall it looks like a rather cool bit of kit that one day, in one form or another, could become part of the handsets of the future.